Sub: Special Allowance to Acountants of PO & RMS in Department of Posts-reg. I am directed to refer to the subject cited above. In this context this Directorate has received various references from the Circles and from the Service Unions regarding continuance of Special Allowance to Accountants of PO & RMS in the Department of Posts. The matter was referred to Ministry of Finance, Department of Expenditure. 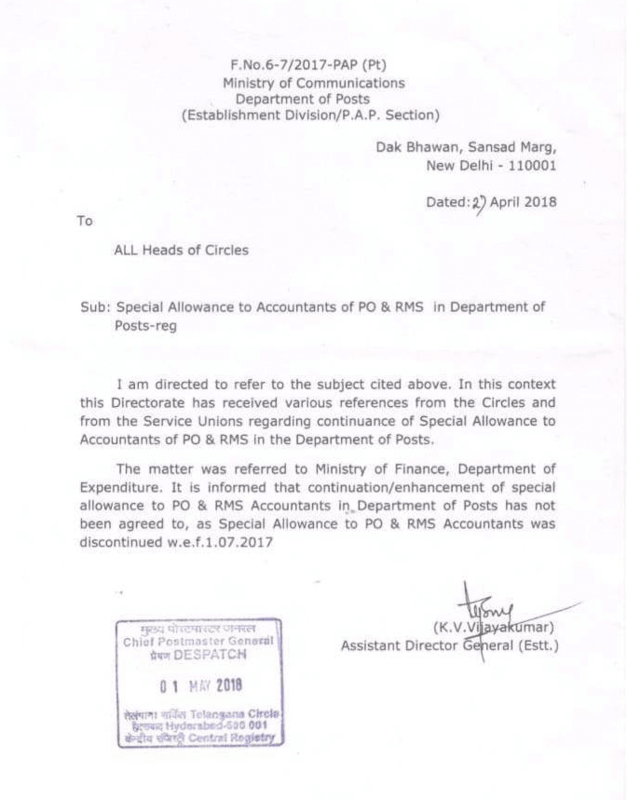 It is informed that continuation/enhancement of special allowance to PO & RMS Accountants in Department of Posts has not been agreed to, as Special Allowance to PO & RMS Accountants was discontinued w.e.f. 01.07.2017.